Hair with dry and split ends is a problem for many women, especially those who often use strong chemicals for perming and coloring, thereby drying the hair. To remedy the situation, it takes time and intense and regular, and most importantly, proper care of them. Hairwho love to restore it is impossible, but when you cut the tips, your hair will look much more attractive. To trim them at home - about a centimeter once in two months, it is recommended to do the "hot scissors". Revise the means by which you take care of the hair. Probably, they will have to change. Use a mild shampoo designed for damaged hair. When shampooing even gentle shampoo should not RUB it into the skin, not to wash away the fat produced by sebaceous glands. Sprivate shampoo and this foam wash hair at the same turn, not hot, and the cool water. Use conditioners and air conditioners that will make your hair softer and more manageable. 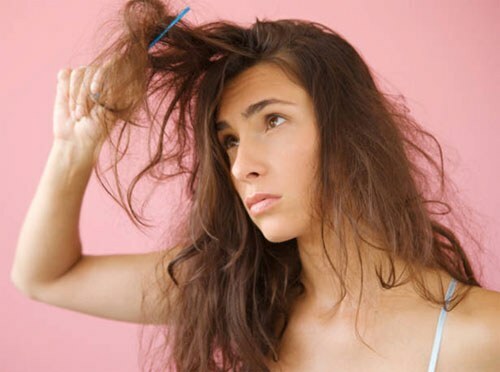 Do not brush wet hair and avoid using metal combs or brushes. Use a mask to treat split ends. Their composition can be extracts chamomile, cinnamon, bamboo, and in addition olive, almond or apricot oil. But before applying read the application instructions not to overdo it. After each washing the hair for 5-10 minutes, you can apply a light hair mask with vitamin E.
For the treatment of weak hair, it is helpful to use lotions and sprays on the basis of thermal water – they do not need to rinse. At the time of treatment it is better to forget about the means of fixing mousses, gels and varnishes. Dry hair should be in a natural way, but if you can't do without a dryer, try to choose gentle drying mode cool air. Rethink your diet. Your body must get sufficient amount of vitamins A and E and fatty acids, so be careful in your menu were sea fish, cereals, nuts, vegetables, olives, dairy products, vegetable oil. Not interfere with the intake of vitamin complexes. Pay attention to your water balance. For skin and hair suffering from dryness, you need a sufficient amount of fluid so try to drink at least 6-8 glasses of water. Dry and split ends, lifeless and unruly hair – all this is the result of improper care and dysfunction of the sebaceous glands of the scalp. The use of such devices as hair dryers, Curling irons and flat irons, causing enormous harm to your hair, dries and burns them. So how to put in order the hair and to get rid of dry ends? There is one very effective tool that will help to moisturize the hair ends. Take a few tablespoons of burdock, almond or olive oil and gently heat in a water bath. Liberally lubricate the ends of the hair and leave for 30-40 minutes. Then rinse in the usual way. The oil will help protect the hair from drying that occurs during shampooing. Excellent effect on dry and lifeless ends of your hair having a haircut hot scissors, hot metal in the literal sense of the word seals the ends. It will greatly improve the external condition and appearance of hair, they will not look dry and brittle. But it is worth noting that this method does not cure your hair, but only for a certain period improves its appearance. For best results, take three to five cuts in this way. Dry the tips are very thin, so easily torn and broken. They require careful treatment. Brush your hair only as needed, use the brush with a few teeth from natural fibers. Refrain from daily use of a hair dryer, Curling iron and flat iron, as well as from mousses and gels which dry and aggravate the hair. Wash the hair problem are recommended once a week nourishing shampoo designed for dry and brittle hair. No matter how you try to cause your hair in order, you will not get a positive result until you get the diet. Start solving this problem from the inside. Hair should get enough nutrients, this will include food nuts, fish, cereals, seeds, fruits and vegetables. Do not forget about vitamin complexes, the benefit of pharmacies is a huge selection. Good results for dry ends give a mask made from dairy products. Take the yogurt and gently heat in a water bath, massage into the hair roots and spread over the entire length. Pay special attention to dry ends. Put on the head of a plastic cap and towel. After thirty minutes, again massage the yogurt into the hair and massage your scalp for five minutes. Rinse all with warm water with a mild shampoo.